AN EARLY LINK TO THE GEORGE WASHINGTON BRIDGE: Constructed between 1930 and 1933, the existing Route 4 connects the George Washington Bridge with Paterson. The 10.9-mile-long route serves as an important artery through Bergen County, carrying approximately 100,000 vehicles per day (AADT). West of NJ 208 in Fair Lawn, NJ 4 is a four-lane, 40 MPH arterial route with at-grade intersections and traffic lights. East of NJ 208, NJ 4 takes on a somewhat more limited-access nature. The mostly six-lane route (which narrows to four lanes in some locations) provides grade separations and has a 50 MPH speed limit. However, the pre-expressway era route suffers from inadequate ramps, acceleration-deceleration lanes, and numerous curb cuts for the businesses that line the route. PROPOSED FREEWAY UPGRADES: As early as 1936, the Regional Plan Association (RPA) recommended inclusion of the NJ 4 corridor in its network of expressways that were to supplement existing parkways in the New York metropolitan area. Unlike the existing parkways, the expressways were to be open to all traffic. However, the outbreak of World War II delayed work on the ambitious expressway network. After World War II, New Jersey officials, with the assistance of Triborough Bridge and Tunnel Authority (TBTA) chairman Robert Moses, revived plans for an east-west expressway from the George Washington Bridge. Specifically, the 1955 Joint Study of Arterial Facilities, organized by the Port of New York Authority and the TBTA, established the blueprints for expressway and bridge construction over the next decade in the New York metropolitan area. Under the Joint Study, the "Bergen-Passaic Expressway" was proposed as an express route from the George Washington Bridge west to Paterson. The new expressway was to be constructed in conjunction with the lower level of the George Washington Bridge. The revised plans for the Bergen-Passaic Expressway called for an eight-lane roadway, with a center median wide enough to accommodate two additional lanes, or two rapid transit tracks. This required a right-of-way of up to 300 feet along the entire length. The third alternative, a new alignment west to Paterson, was seen as the least expensive and least disruptive of the alternatives, and the best suited to meet future traffic demands. In the 1960's, the RPA once again recommended the upgrading of the existing NJ 4 arterial to freeway standards. The proposed NJ 4 Freeway was to connect to the upgraded NJ 17 and NJ 208, two arterial routes that were also to be upgraded to freeways. However, this proposal was dropped amid concerns of community disruption. CHANGES FOR ROUTE 4: In November 1999, the NJDOT completed a two-year-long, $120 million project to reconstruct the Paramus interchange between NJ 4 and NJ 17. The original cloverleaf interchange, which dates back to 1932, was outfitted with two new flyover ramps that provide for three levels of traffic. 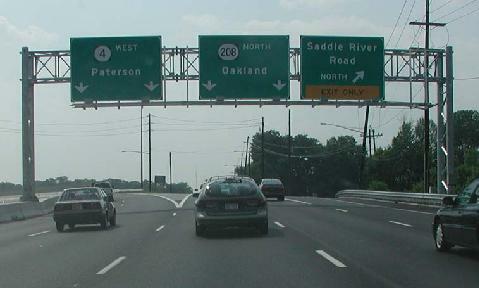 One flyover connects southbound NJ 17 to eastbound NJ 4, and the other flyover connects northbound NJ 17 to westbound NJ 4. A second interchange was constructed on NJ 4 to serve nearby shopping centers. During 2001 and 2002, the NJDOT rebuilt the Fair Lawn interchange between NJ 4 and NJ 208. The $32 million project improved safety and circulation through the interchange, which was originally constructed in 1952. It featured the construction of new local and express lanes on both NJ 4 and NJ 208, the construction of a new bridge to carry the eastbound express lanes of NJ 4 over eastbound NJ 208, and the rehabilitation of the bridge carrying NJ 208 over Saddle River Road. Improvements also were made to shoulders, acceleration and deceleration lanes, drainage, signing and lighting. East of the NJ 4-NJ 17 interchange, the NJDOT currently is widening 1.8 miles of the existing NJ 4 through Paramus and River Edge. Part of a more comprehensive plan to widen NJ 4, the project will include the construction of improved acceleration-deceleration lanes, new auxiliary lanes with bus turn-outs, reconfigured interchange ramps, and new bridges to accommodate the widened roadway. SOURCES: "Freeways Are Now Urged," The New York Times (12/13/1936); Joint Study of Arterial Facilities, Port of New York Authority and the Triborough Bridge and Tunnel Authority (January 1955); "Plans for Bergen Expressway Stir Protest in Passaic County" by George Cable Wright, The New York Times (1/17/1956); "Expressway Plans," Regional Plan Association News (May 1964); New Jersey Department of Transportation; Raymond C. Martin; Christopher G. Mason; Dan Moraseski. NJ 4 shield by Ralph Herman. NJ 4 exit and intersection list by Ray Martin. Back to The Roads of Metro New York home page. Site contents © by Eastern Roads. This is not an official site run by a government agency. Recommendations provided on this site are strictly those of the author and contributors, not of any government or corporate entity.